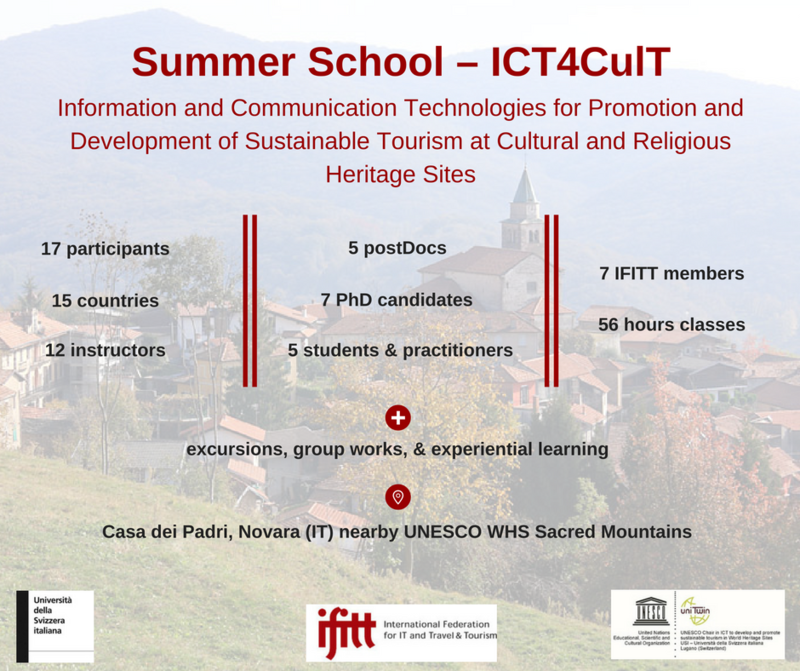 The 2016 Summer School of the UNESCO chair in ICT to develop and promote sustainable tourism in World Heritage Sites, established at USI – Università della Svizzera italiana (Lugano, Switzerland) is co-located together with IFITT (International Federation for IT and Travel & Tourism) doctoral summer school. IFITT is the leading independent global community for the discussion, exchange and development of knowledge about the use and impact of ICT in the travel and tourism industry and experience. Besides representing a wide segment of the tourism market, cultural tourism is an opportunity for territorial development and cultural promotion. It points out, in fact, the very goal of tourism: to exit known territories in order to enter new spaces and encounter different human communities, cultures and lifestyles. In particular, sacred heritage needs to be considered, since it constitutes a major part within every culture. Information and Communication Technologies might play key roles in supporting and enriching cultural tourism, promoting a sustainable approach and enhancing the understanding of different cultures and traditions. The working language of the summer school will be English. The Summer School featured ex-cathedra classes, discussions, hands-on workshops, poster sessions, and guided tours. Not to mention social activities. Hereafter an overview of the trainers and of the activities/topics they cover.